Accumulated manure can cause health, odor, and water quality problems if not properly dealt with. One option is to collect the waste daily, load it in a spreader, and spread it on cropland, hayland, or pasture. This is time consuming and also has to be done regardless of the soil moisture, weather, or time of year. Spreading on saturated soils compacts and compromises soil quality; spreading on frozen soils can lead to offsite manure runoff. The alternative to daily spreading is to stockpile or store the manure for a period of time, at which point it may be spread or hauled away and utilized beneficially elsewhere. Even though the number of livestock on your farm may not be large, enough manure will be generated to pose a problem if planning is not done. For example, a single horse can produce 50 pounds of manure per day which translates to 11 cubic yards and 9 tons annually. The manure and bedding produced by one horse in a year can exceed 25 cubic yards. This would require a storage area of about 12 feet by 12 feet with an accumulated depth of 3 to 5 feet for one year of storage, depending on how much decomposition and compaction of the manure takes place. Why Do You Need a Manure Storage Facility? The capability to store manure reduces or eliminates the need to spread manure on a daily basis. The primary reason to store manure is to allow for land applications that are compatible with the climate and cropping systems on the land receiving the manure. Saturated, wet, frozen, or snow-covered soil conditions are not suitable for land application of manure. The nutrients in horse manure are best utilized by the crop when spread before or during the growing season of the crop. Many horse farms do not have fields on which to spread manure. Manure storage facilities also allow the farm owner to store the manure until it can be removed and used by other farmers or landscapers. The first thing to decide when contemplating storage is the location. Manure associated with livestock production includes stall waste (feces, urine, bedding) and manure collected from exercise lots. Manure storage areas may simply be well-drained areas where manure is stacked or stockpiled for subsequent spreading or removal. Manure should be stored in areas accessible to trucks, tractors, and other manure removal equipment. Manure should not be stored in paddocks or exercise lots, because lots can become infected with parasites. The storage must be located well outside of any stream, wetland, or floodplain, and should have a slight slope for drainage, but not so steep that runoff can cause problems. It is important to prevent manure from being washed offsite to streams or lakes. A well-drained manure storage area will prevent the pooling of polluted runoff that could serve as a breeding area for mosquitoes and flies. Odor management is another consideration when siting a storage. A vegetated filter strip to treat the runoff water coming from a manure pile or a concentrated livestock area can reduce the pollution potential of manure runoff. Look at wind direction as relates to dwellings and locate storages upwind. The final consideration is aesthetics. If possible, keep the facility out of view of neighbors and passers-by. The presence of trees around the facility will help to dissipate odors and keep it out of sight. If no well-drained, level areas exist for manure storage, or if run-off presents a water quality issue, permanent manure storage facilities may be required as described by the USDA Natural Resources Conservation Service (nj.nrcs.usda. gov). Permanent manure storage facilities should have an impervious bottom, and may have solid walls to confine the solids and a “push” wall for stacking and loading of the solids. Contaminated runoff or leachate from manure storage facilities may require the construction of a vegetative filter to reduce the possibility of contaminated waste reaching water bodies. See Table 1 for a description of setbacks and minimum distances to be followed when siting a manure facility. (Adapted from On-Farm Composting Handbook, NRAES 54, 1992). Please check on local standards as local manure storage areas and facilities should be sited based on existing regulatory standards. How many animals are on the farm, and how much of the manure is collected? What is the time period the storage will be accumulating manure before emptying? How much money is available for building the facility? The size of the manure storage area is dictated by manure removal practices and number of animals specific to the farm. If the manure is spread on croplands on the farm, the storage area should be large enough to hold manure when fields are inaccessible. If manure is removed for off-farm use, the size of the manure storage area will be determined by the storage space requirements between removal periods. (The USDA Natural Resources Conservation Service should be consulted for more specific information about sizing storage facilities (nj.nrcs.usda.gov)). 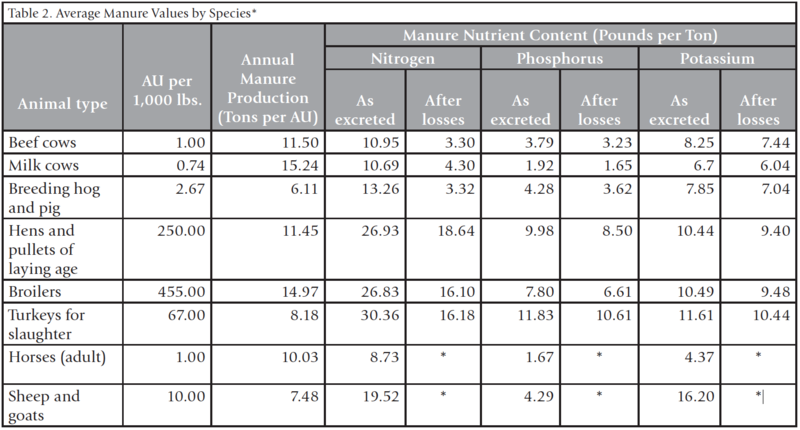 See Table 2 for a description of the amount of manure produced and its nutrient content from different livestock species. It is easy to see how a storage facility can get large quickly, even with just a few animals. Also consider that a permanent manure storage facility should have capacity for six months; the minimum should be three months. Keep the clean water clean. This means that rooftop or surface runoff should be diverted away from manure storages, dry lots or other livestock concentration areas. Gutters and downspouts often are the best way to collect and convey rooftop runoff to an underground outlet pipe, or recharge to the ground water in very well drained soils. Treat the dirty water. Any rainfall landing on the manure pile or in livestock concentration areas should drain to a treatment area, such as a well-vegetated filter strip. The grasses absorb and reduce many of the pollutants in the runoff. Store the manure out of a flood hazard area. Flood waters that can reach a manure storage location will transport manure downstream and cause extensive water quality problems. Store the manure where it is easily accessible to load and unload. Efficiency is important in order to properly manage the manure facility. Avoid steep slopes when siting your storage location. The steeper the slope, the more difficult it is to manage the storage area, and the greater potential for offsite runoff. Follow a nutrient management plan. If you spread the stored manure on your own land, do so following a nutrient management plan that establishes the spreading rate per acre to match the nutrients available in the manure to the needs of the crop. Storage can be very simple or quite complex; very inexpensive or quite pricey. The choice depends on a number of factors. When properly managed, flies, odors, dust, and particulate matter can be controlled. Manure should be kept as dry as possible, since wet manure provides a breeding ground for flies and will lead to the presence of fly maggots. A roofed storage area may be advisable to keep manure as dry as possible when stored for long periods of time. Flies and odors from stored manure can be reduced if good management is practiced. Keep the manure as dry as possible. Remove manure from the farm regularly during fly breeding season. Try not to use insecticides or larvacides; naturally occurring fly predators (tiny, non-stinging wasps and parasites) may be beneficial to the pile. Wasps are active during fly season and their activity is better in dry manure. These predators, which are commercially available, are the enemy of most pest flies including house flies, horn flies, face flies and stable flies. They live in manure or compost piles and kill pest flies before they hatch. These should be used as part of a complete pest management program that may also include chemical controls. It is important to avoid overusing pesticides to control flies. When cleaning out the storage, leave a couple of inches of dry manure over the bottom of the storage area to provide a population of fly parasites and predators. Manure removal can be staggered to leave one section per week to supply fly predators and parasites. Remove the winter’s stockpile of manure during cold weather (<55°F), before fly breeding season. It is crucial to have a vegetated filter strip to treat the runoff water coming from a manure pile or a concentrated livestock area. The combination of grass uptake, soil filtering and adsorption, and biological processes in the top inches of soil significantly reduces pollution potential of manure runoff. The filter should be established in a vigorous, thick stand of grasses adapted to the soil conditions at the site. Animals should be kept off, and it should be mowed or cut for hay at least twice a year to remove nutrients and encourage growth. On a flatter slope, the strip should be a minimum of 30 feet wide, wider if slope is steeper. Manure should not only be removed from stalls and barns. Corrals, barnyard areas, and sacrifice areas, also referred to as exercise lots, dry lots, or stress lots, should be regularly cleaned to reduce flies, odor, and the potential for mud. A box scraper, skid loader, or tractor and loader can be used to remove manure built up on the surface of these areas. Stockpiling of manure is just what it sounds like- simply taking the solid manure and soiled bedding and piling it up in a convenient location. This primitive method can be acceptable for the farm with just 1 or 2 horses or several sheep. However, the spot must be compacted and sealed so that rainfall landing on the pile cannot leach pollutants into the soil and ground water. Sometimes gravel in a packed pad works well, or stone dust can be used. The area approaching the pad needs to be firm to prevent rutting in wet periods. Also, the pile should have a slight slope (1–3%) to facilitate drainage to a vegetated filter strip. A stockpile can be covered with a plastic tarp to reduce odors, flies, and leaching concerns. Rainfall will run off to the edges and never penetrate the pile. The tarp will need to be anchored securely all around the edges. A filter strip of vegetation is still needed on the downslope side. This is probably the most common and practical choice for the small livestock operation. A dry stack facility has three walls to contain the manure. The best ones have a poured concrete floor. The floor is slightly sloped for drainage out of the facility, and the drainage runs to an adjacent vegetative filter strip. The walls of a dry stack facility should be a minimum of four feet high. The walls, especially the back one opposing the entry, must be stout since the manure will be exerting outward pressure as the pile grows higher. Also, clean out is usually done with a front-end loader, and pushing will be done as the manure is scooped up. The walls can be poured concrete, cinder block, horizontal timbers, or vertical timbers. Secure anchoring below the frost line is crucial. The treatment of raw manure through composting is gaining popularity. The final product is crumbly, low odor and resembles rich topsoil. It is often highly marketable. Composting, if done correctly, reduces the amount of available nutrients, kills pathogens, and reduces odor and manure volume. However, it requires management. A pile of manure left alone is not composting—it is decomposing; these are not the same. Composting is a managed process, resulting in accelerated decomposition of organic materials. Microorganisms, including bacteria, actinomycetes, and fungi will break down organic materials at elevated temperatures. Composting is a recommended management practice for horse manure management and, when done properly, will result in the destruction of internal parasites and weed seeds. The composted product can be spread on pastures according to a nutrient management plan that accounts for crop uptake of nutrients. Avoid overspreading. Composting requires proper levels of moisture and oxygen, and the appropriate feedstock mixture to ensure proper microbial activity. Aeration or turning the composting material ensures that all parts of the manure pile reach elevated temperatures for a certain time period (see Rutgers Composting Bulletin E307 for more information). Compost will be less odorous than fresh horse manure and may have value as a soil amendment or fertilizer. Turning the pile is usually done with a small tractor equipped with a front bucket loader. There are many ways to set up the composting site. It could just be several long windrows, 4 to 6 feet high, on compacted ground or compacted gravel, or concrete. Or, there may be several small dry stack-type bays connected together side by side, the manure is moved from one bay to the next, mixing and aerating while the manure composts in the process. Manure and bedding, when properly mixed, can be transformed into compost in as little as six weeks. Liquid storage is used mainly by larger dairy or swine farms. The waste is diluted with stall wash water and pumped to a lagoon or other holding location. From there the liquid effluent and the solids are pumped into an injector tank and spread in the field as a slurry, either sprayed on the surface or injected into the soil. Alternatively, the effluent is spray irrigated and the solids are separated and spread in a conventional fashion. This type of storage and management system is usually the most complex and expensive, and is usually not practical for smaller livestock operations. Sometimes, the best solution is to simply have a dumpster or some other form of portable holding structure, and place the manure in there. When needed, a waste management purveyor can pick it up for beneficial re-use on cropland that can use the organic matter and nutrients. Remember, a vegetative filter strip to treat the leachate draining from the dumpster is still needed. *From Technical Fundamentak of CAFOs fir Permit Writers and Inspectors. 2008. Manure Generation. US-EPA Office of Compliance and Wastewater Management. ** No known values; ***After losses column refers to the amount reminaing after several months in storage. If the amount of manure being generated daily is small enough, a small manure spreader can serve as the storage device. When full, simply hook up the tractor and spread the waste in the cropland or hayland according to a nutrient management plan. However, if applying to pastureland, it is important to spread the manure about four weeks before a grazing cycle. Smothering of grasses may occur if manure is applied too heavily. Parasite eggs in raw manure may cause an infestation problem for grazing horses, and weed seeds can be spread back into the soil. Keep the clean water clean. Store the manure out of a flood hazard area. Store the manure where it is easily accessible to load and unload. Avoid steep slopes when siting your storage location. Follow a nutrient management plan. MWPS. 2004. Manure Characteristics Guide. 2nd Ed. Midwest Plan Service. MWPS-18, 2004. Ames, IA. © 2014 Rutgers, The State University of New Jersey. All rights reserved.